Over the years I have made many trips out to Palm Springs from LA for work and pleasure. The stretch of road just outside Palm Springs is home to hundreds of windmills taking advantage of the narrow gap that forms between the desert and the LA basin that ends at the Pacific Ocean. 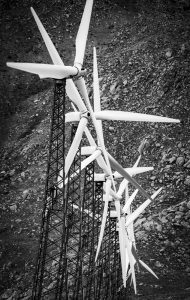 The windmills jut from the desert landscape like teeth on a comb – wind tugging and pulling at the turbines metal blades. The resulting resistance bringing the wind down from the sky into a tangible renewable resource. Today I had both the time and inclination to stop and see how close I would be able to get. Not that close it turns out. What I had in my mind was something more intimate. Something that showed the scale and immensity. Instead, I had to settle for a longer perspective. My attempts to gain closer access blocked by fencing and menacing signposts warning of criminal prosecution. As a first attempt, it was OK, but I have plans to return again. My fascination with these things not ended with only a single visit. Wind turbines are shooting up all over the world – Ireland, Northern Ireland, Shetland and the Outer Hebrides. They are erected in and along the tourist areas, causing the same visual blight we have in Palm Springs. So sad to see these in the remote historic areas.